I didn’t plan on getting the D2 Millie when it was announced, because I do not consider myself a steel junkie. Yet, when I saw the first pics and positive commentaries I caved. 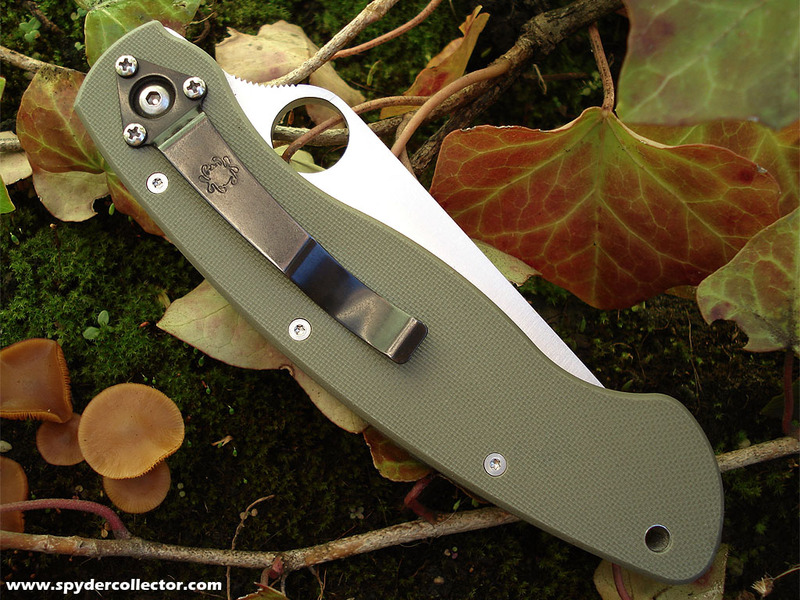 I must admit that the green G10 handle was what appealed to me most. Now, however, It’s the steel that I like best. The Military is an old friend for me. It’s the model that really started my obsession with Spyderco and I’ve carried it for a long time around 2000. Soon, smaller high-end models came out that were better suited to urban EDC, like the Lum Chinese Folder and Li’l Temp. Today, my main obsession is with 3-inch bladed spydies. This Foliage Green Military was supposed to be ‘just for fun’, to try it out. The minute I picked the knife up, it was like an old friend coming home. 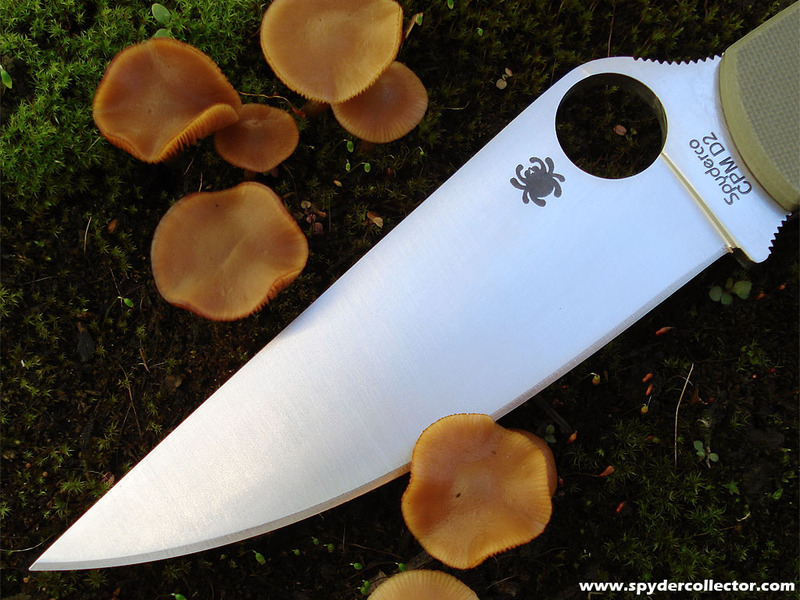 Even with the smaller and larger improvements since 2000, the knife still has that great slick feel to it. Initially, the liner was really stiff. It was tough to unlock the liner. This lasted for about a week, then the D2 Millie’s action became smoother. Now it’s almost as slick to open and close as my original Military. 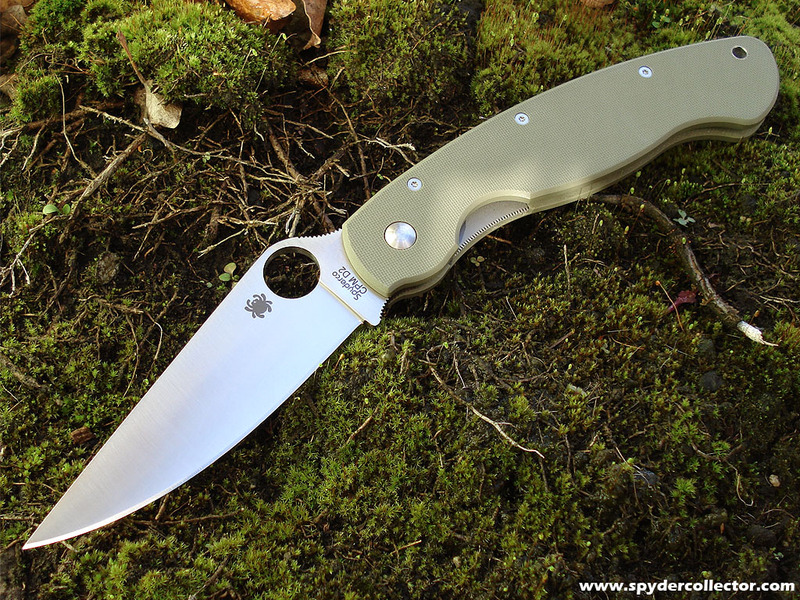 The foliage green G10 is very light in shade, it seems lighter than the foliage green in the Delica 4. I like the color a lot, it’s both subtle and different from anything else I’ve seen on knives. The jimping in the spine and in the choil proved to be a welcome surprise. I was a little worried that the jimping (any jimping actually) in the choil would be too aggressive for my office-honed fingers ;-). I’m happy to report that this is not the case, the fine jimping is ‘just right’. The handle seems a bit thicker compared to my 2000 model, but it handles just as nicely. Onto the D2 blade. As was pointed out by my fellow forumites, the blade came out of the box lightly oiled (with a little card explaining why) and quite sharp. It was sharper than my ZDP Spydies out of the box, I didn’t know that was possible 😉 . Even more surprising was the fact that this wonderfully sharp edge stayed sharp. The first couple of weeks were relatively boring for the CPM D2 blade: mail, fruit, occasional mail, kitchen duty etc… The edge still wasn’t noticeably dulled and it still shaved hair without scraping. My ZDP blades would normally need a slight touch up after this workout for a few weeks, to shave hair without resistance. I upped the ante for the Millie’s blade by attacking our paper-pile; what better way to ‘do green’ than with a ‘green spydie’?! Spending an hour breaking down boxes into compact bundles involved both cutting, hacking and prying with the blade. The lock held wonderfully, no accidental closure, probably due to the slightly smaller lock well (compared to my 2000 model) and the blasted liner ‘sticking’ more to the tang. I also didn’t experience any tip breakage (the pics were taken this morning). Finally, the blade wouldn’t shave hair any more. It was still very sharp, a fine working edge. I decided to sharpen the blade, fearing that it would be really tough if it got much duller. I’m happy to report that the factory bevels matched my Sharpmaker’s 30 degrees setting really well. So it was easy to give the Millie a fresh edge. I’m trying a mirror polished edge right now that I like quite a bit. First, I wish the Military would get some left-handed clip options. Right now I carry it SOB, which works pretty well for me (I do understand the risk of falling on my back and onto the handle), but it’s not the same as a dedicated clip option. Second, the liner lock is still a solid technology for a utility folder (keeps everything nicely lightweight too), but a more lefty-friendly lock would be appreciated. I would like to suggest the new caged bal lock for the Millie. Third, I don’t really like the blasted coating on the liner. It makes for a rougher surface and perhaps contributed to the lock sticking to the tang at the beginning. Why was liner blasted? The D2 Millie is a great knife. The best folding kitchen and camp knife you could ask for. This updated version is still a lightweight knife that performs. Additionally, I think this knife is slowly getting me interested in the steel side of things. I wouldn’t call myself a steel junkie just yet, but I am getting more interested in the Mule Project. This entry was posted on Sunday, November 11th, 2007 at 10:10 am and is filed under Collectibles. You can follow any responses to this entry through the RSS 2.0 feed. You can leave a response, or trackback from your own site.